I've been wanting to write this for a while, but I just haven't. I need to though, so we are all on the same page. I'm Baptist. I'm an independent Baptist. (see #1 below) I'm a classic fundamentalist. (see #2 below) I have arrived here through careful consideration and study. I have thought through my convictions and theology. I am friends with those who have left this movement; I am not. We have our share of issues, but that's why I value being independent. I don't have to answer for the wackos, and I can call them out as such when necessary. With that being said, I want to address the issue of quotes and influences. Often I have witnessed young fundamentalists quote those from outside of our circle and immediately be derided as being "liberal", "unseparated", or headed down a slippery slope to new evangelicalism. It is because of this prevailing practice that I have hesitated in quoting and posting excerpts from helpful works (too far) outside of our circles. This becomes amplified for a missionary (such as myself) who raises support from dozens of individual churches. Public discourse must always be measured. We ought think before we speak. (James 1:19) Somethings, while true, are better left unsaid. Yet, there can be a chilling effect when we allow external forces to hinder helpful thinking. So what can you expect of me? I will post on Twitter, Facebook, and this site things that I find helpful and true. Scripture is my standard. After Scripture, we should use our reason and common sense. I will note when I am in partial agreement with a quote or excerpt. Sometimes it is helpful to discuss something that is partially right and partially wrong. I will have a reasonable mix of those within "my circle" and those without. There are good, helpful, Biblical thinkers in both areas--but you can guess who I will most often agree with. I will discuss and quote unbelievers when they speak truly. "All truth is God's truth." Because of common grace and being created in the image of God, all people can contribute. So what I am going to expect of you? Trust me that I am what I say I am. I am not liberal. I'm not becoming a new evangelical. I have read outside of my circle for over a decade, and if anything, I am a stronger independent Baptist today than ever. Only a handful read it. 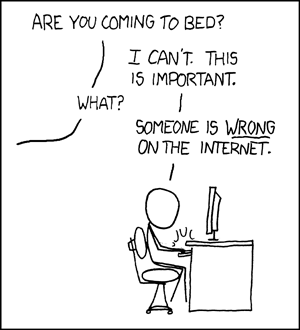 I don't have the time or inclination to be a referee for internet arguments. I am excited about the days ahead serving Christ. It shouldn't be necessary to spend over 700 words laying all of this out, but I want my position to be clear. Who I am. Where I am going. What I am doing. The first two questions and answers from Lancaster Baptist Church give a good summary statement of what that means. The old one too. See page 3, note 3 for one of many notes on the gap theory. See page 1069, note 1 for one of many references endorsing the Critical Text and textual criticism. I could go on.